A lion and a deer. And a pick-up truck. It was the second mountain lion I'd seen this year. 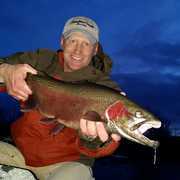 The first had been after an overnight fishing trip in June. This one was at the beginning of a deer hunt. They both came with other significant things - the one in June had been my first 30-inch brown trout. This one came with a unique buck. This has been a full fall. Not necessarily in the busy sense, but the satisfactory. It was filled with good trips, lots of action, and multiple hunting partners with successes. 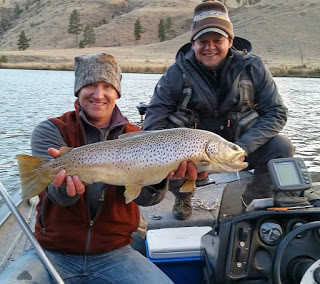 Even a tank of a brown trout made it to the net between hunting trips. I was with one guy when he took his first animal ever. I helped quarter and pack another friend's 370-class bull-of-a-lifetime. I watched two different hunting partners make their longest shots yet, and both animals dropped where they stood. 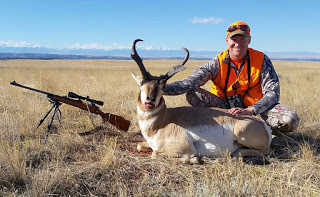 I was with another hunting partner when he took his first two antelope on consecutive days. And then there was my own action. One day in particular stood out over the others. A day where I took a big game double out on the rugged prairie. In September, night trips for big browns morphed into nights sleeping on the ground among sagebrush once bow season kicked in. There were encounters with bulls, including a time I walked in on two battling it out and still didn't get a shot. I never fired an arrow of my own all season long, but took part in packing two archery elk. Opening of antelope in October was a blast. Myself and two hunting partners tagged out on bucks and a couple does. 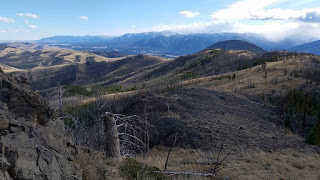 On opening of general rifle season two weeks later my hunting partner and I made some moves on an elk herd across canyons and burns at high elevation that resulted in a bull taken. Our day had begun at 2am and with a thirteen hundred foot vertical gain. And rifle deer was yet to come. Deer hunting - and more and more mule deer hunting in particular - is my favorite. Especially during rut. I look forward to the waning side of November every year and reserve a block of time toward Thanksgiving to be devoted to it. This year I had a specific place in mind - right back in the same basin that I'd followed that bachelor herd around in with my bow. For three consecutive years I've been elk hunting in a piece of scrubby, broken, and rugged country during archery season. Each year I've seen good bucks. And each year I'd sworn I'd return during rut to hunt it in rifle season. Somehow two years had passed without making it happen. And the first trip I'd planned this year in mid-November was snowed out and hampered by single digit temps. The trip just wasn't smart to make. But the weather broke and warmed to the point that as the last week of the season approached, I could foresee the possibility of breaking out the bivvy gear and putting it back into use. Nights were not forecasted to drop lower than the upper 20s. Sleeping on the ground would make penetrating the country I wanted to hunt possible. The plan for this hunt was very clear - target the area I'd seen most of the largest racks and glass for days. I would be passing on all until I found a buck of the caliber I knew was there. But all that can change. Expect the unexpected and be flexible. I woke in the frost on the first morning of what was to be a multi-day hunt. I had allotted four days, but I was extremely excited that I might start spotting them the first day. I had hiked in five miles the night before, most of it in the dark. But I'd seen active deer while there was still daylight and even bumped into a curious buck on a ridgetop in the dark. Anticipation for the next day ran high. And I was finally here in this spot, with a rifle, and during rut. 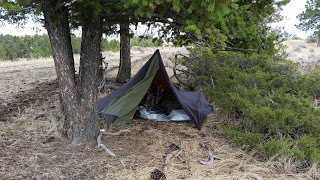 I slid from my bivvy sack and unzipped the floorless teepee tent. I took food from my hanging bag, stuffed my pack, and wandered out onto the ridge where I would begin my glassing. In the dusky dawn I spotted my first buck of the day - right where I expected it to be. He was pushing a group of does up a hillside. In years past my tag would have been notched right then as the sun broke the horizon. And it still may have been a higher-scoring buck than any I've taken yet - but I knew there were a dozen bigger ones. And I had four days to find one. Plus, I was really here for the hunt itself, and that was just getting going. In the words of Trevor Johnson [Kit's Tackle, Helena MT] - "the size of the antlers don't make up for the size of the hunt." It was with no remorse that I watched this quality buck disappear over a ridge. Later that morning and a handful of smaller bucks later I was sitting on a prominent point. I was glassing an area of probably two square miles. 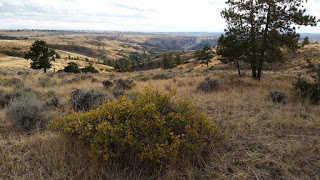 I was looking across a major coulee and into several tributary draws on the other side. I located deer in six different places. Only one of those was on my side of the big coulee. I routinely checked each group of deer, waiting for a buck to make an appearance. The biggest group of deer was a herd of six does. Seemed like a large group to be alone, and I checked it frequently. Another group off to the left and probably a third of a mile away from the six seemed like another good bet, and I felt like I'd seen a buck or two, but hadn't been able to verify yet as they filtered through the junipers. There was a buck on my side. A loner three-point with oddly heavy beams for how short they were. Almost uniform mass throughout. He walked a glowing ridge, weaving over and across the line of bright sunlight and dark shadow - sometimes standing in the shadow but with the hair on his back shining radiantly. 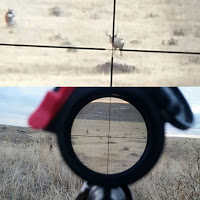 The next time I passed over the six does with my binos I noticed they looked agitated. I perked up. Was a buck on the scene? A few does started to run, then stopped. Another doe bolted the opposite way onto a low ridge and stopped just as suddenly, staring down into a shallow coulee. It stood frozen. None of them moved, no buck showed up, and I could see no reason for the alarm. I lost interest for the moment and glassed the other deer I was keeping tabs on around the basin. When I swung back to the does again they were still frozen as I'd left them. The idea of coyotes came to mind. I couldn't see anything, but I was too far for binos really. I decided that all the action was on the other side of the valley, so I'd make my way to that side for a closer look. I'd check on this group of six does first, then veer off to the next most likely group if they were a dead end. I dropped into the valley and picked my way across the drainage. By the time I started climbing the other side, none of the deer had been in my view for going on half an hour. I was approaching the sideslope that would lead up to the ridge where I thought I'd have my first vantage of the deer again. Three deer suddenly burst across it. I deployed the bipod and settled in, hoping the next deer to appear would be a buck in pursuit. But then I noticed that one of the three deer was a buck. And it was running with the does, not after them. The deer were spooked. They passed out of sight and nothing else appeared. I stowed the bipod and walked a few more feet. I didn't see how I could have spooked the deer, and I assumed they must be running from whatever had been agitating them. Coyotes most likely. They'd been yipping around the basin that morning. And then a head popped over the ridge. Clearly the head of a cat. The bipod was back out and I was on my belly in a single instinctual moment. I knew it was a cougar, but the binos proved it. The rangefinder replaced the binos. All I could see was head at first, and then it walked out onto the slope in fairly short grass and sat down on its hind quarters. It was obviously annoyed. Miffed. It looked in the direction the deer had gone, switched its tail, and flicked its ears. Then it looked another way, aloof, seemingly indignant that it had botched its stalk. I lowered the rangefinder. The display had read 208 yards. I backed the scope turret to the exact tick mark. Probably four seconds had passed since the cat had sat down. I settled the crosshairs on the slim target and squeezed. The cat was down without a twitch. Two seasons earlier I had observed a large set of cougar tracks with a massive stride dropping down what had been a muddy slope before it dried into the crusty state I found it. I had researched the regulations after that and knew mountain lions were fair game in this unit. And like I would have anyway, I always made sure to have a cougar tag tucked away somewhere in my stack of license papers and tags. I never really expected to dig it out, but here I was - as if in a foggy dream - searching through the pile and cutting out the month and day - on a cougar tag. A "just-in-case-I-get-lucky" tag. I had gotten lucky. And I will never view a group of agitated deer in the same way again. I'd seen similar behavior in the past - sometimes over coyotes, sometimes over something I was never able to verify. I'll look harder next time. But what I couldn't recall now were the specific reporting requirements - the details of calling the cougar harvest in to Fish, Wildlife, and Parks. 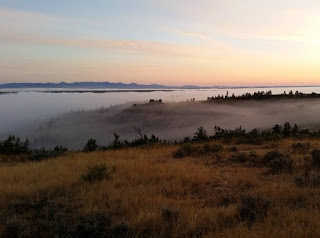 I decided to climb to the tallest hill I could see, approximately half a mile away. Experience in the area told me that it was a likely place for getting enough cell coverage to look the exact rules up before I determined my next move. With the cougar on the ground, my hunt was compromised. Not in a bad way, but it had certainly taken an unexpected turn. I had all but come to terms with the fact that I had to pack it out and head back to civilization to take care of the cat's hide and meat - which meant abandoning the deer hunt. The hunt I'd been looking forward to for three years. I turned away from the cat and started the climb, wrestling with conflicting feelings of elation over the lion and disappointment over the abruptly-ended deer hunt. Off to my left was the coulee with the deer I'd wanted to check out next. It was more-or-less in route to the hill I planned to climb, so a slight deviation wasn't much of a problem. I'd take the next ridge over from the one I was on up to the top. It would give views toward my second-most promising group of deer. I wasn't but a couple hundred yards from where the cougar lay when I spotted three bucks trotting my direction single file on the other side of a coulee - right from where the next group I'd earmarked to check out was located. The buck in the lead was small, but the next two were possible shooters. Binoculars showed the second was a standard 4x4, smaller than the one I'd passed at daylight. The third deer had more going on up top and was heavier. As they trotted down into the coulee and out of sight the binos revealed that each tine on the right antler of the third deer forked. I could tell the left appeared to do the same. If so, it was at least a 6x6. "Forks within forks" - this was one of the criteria defining a "shooter buck" for this year that I'd mentally set before the season started. Not that it mattered, but having some criteria does two things - it leads to bigger bucks and it makes the hunt last longer. 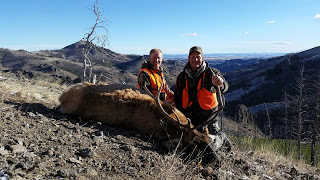 But now - all criteria aside - how many people can say they've taken a mountain lion and buck at virtually the same time? I'd seen the front fork on the right side really well - it swooped grandly forward, and both tines forked again. The back fork on the G2 was weak, but matched the extra forks of the front. I decided that if the buck emerged from the coulee again, I'd take it. I knew it was a smaller-framed buck than the one I'd passed on at first light, but it was a unique buck. Different. And once I started packing the cat, I was not likely to hunt here again this year. Maybe, but no guarantee I'd manage to drive half way across the state. I'd likely finish my deer season elsewhere. The buck had been third in line, so I expected it to show up third again. But it popped up first. I was now sitting on the bare grassy flat that defined this ridge - the spot I'd been standing when they first showed up. The land folded from my position into the shallow coulee that had swallowed the bucks. I was prominently exposed, but sitting motionless leaning back into my pack with the bipod fully extended and the rifle pulled into me. Solid. No shake. No obstruction. The sagebrush thickened a few yards in front of me and I probably just looked like a lone bush. The buck never looked my way anyway. It trotted up onto the side slope above the steepest part of the drainage and looked back where it had come from. Presumably at the other two bucks. It didn't crank its neck around to look back, but turned fully around. I would later learn that it was blind in its left eye. Its lower half was in the sage brush. Its upper half was broadside to me and fully exposed. With the scope zoomed to full power I double-checked the rack. Forks within forks. Neither of the other bucks looked remotely like this. It was him. I hadn't even seen the width of the rack yet. 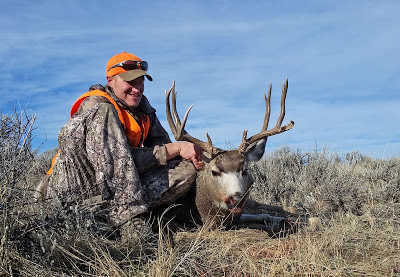 I hadn't watched and studied him the way I had envisioned doing before taking my 2017 buck - the way that I had done with every single other buck I'd been near for the past two months. I still had three more days - but not really. An unexpected trophy lay in the grass behind me. A new trophy was in my crosshairs. I focused on where I would place the shot. Safety was off. For the second time in 20 minutes I squeezed. 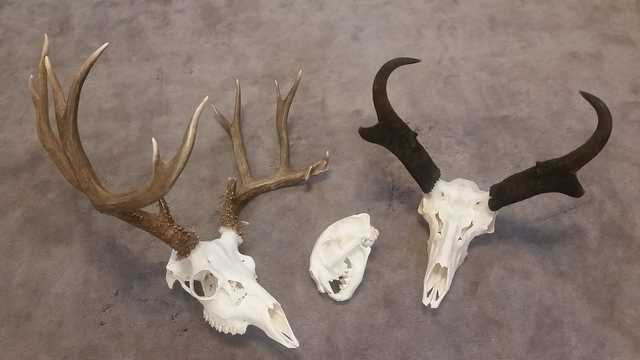 My first multi-species big game double. Neither animal moved from where it had stood. I sat between them - a mountain lion two hundred yards behind me, a buck less than that in front of me. I cycled the bolt and chambered a new round. There was no need to shoot again. After a prolonged period of keeping the scope trained on my buck, I stood and the other two bucks drifted off. My eyes glanced at the high point I was on my way to for cell coverage. I was leaving quite a trail on my way to it. I tagged the buck and took some pictures. I was happy with it, but again a little torn. I'd wanted to be picky. I'd wanted to glass every deer I could find in the area for a few days, sleeping where darkness found me. But here it was late morning on just the first day. And I was done. It was a day that would be hard to top and I'd only barely scratched the surface of the adventure I had planned. I continued to the ridge I had originally set out for. I plugged my phone up to the battery pack and opened up the mountain lion web page (my how the times have changed!). I copied down the phone number I needed to report the lion. The quotas were wide open, so I knew there was no rush within the required timeframe. It wasn't like hound season had started yet. I had probably taken the first cat of the season in the entire region, and it was the only one that would be taken in this four-unit zone prior to hound season. 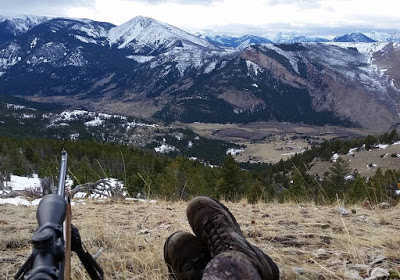 According to FWP quota reports after the general season closed, only 17 were taken statewide during the archery and gun seasons before the winter hound-hunting began. I fired off a few pictures of the buck to friends and family and told a few about the cat. I knew my wife would be particularly excited. For some reason the idea of having a cougar in the house has always intrigued her. I wanted her to be the first know I'd stumbled across the rare opportunity of taking a cat. One that hadn't known I was there. Now the task of processing and packing began. I was six miles from my truck. And five major ridges. I gutted the cat with the smallest incision I could manage. If I could avoid skinning it, I'd leave that to a professional. I propped it under a cedar to drain and returned to the deer. I deboned it into bags and skinned the skull. I hung the bags in a pine and secured the bare skull above them. I figured the earliest I would be back to get the deer was tomorrow. Only two hours of daylight remained. My focus was going to be the cat and preserving its hide. I would either get it to the vehicle that night or camp somewhere along side it between here and there - unless it wasn't possible to carry and I had to make a trip for the pack frame. I was just about to hoist the cat onto my pack over my shoulders and start the trek Robin Hood style when I noticed a pick-up truck. I was hunting public lands near private property. The truck must have come off the neighboring ranch which leased grazing rights here. It had come over the ridge and stopped on top about 150 yards away. I didn't move at first, and neither did the truck. Surely they saw me - a beacon of blaze orange in the sage. The thought crossed my mind - would they haul my meat out? I waved and started walking toward the truck. It didn't move. Various scenarios played out in my mind. I figured there was most likely a 50/50 that I would either get an earful from a disgruntled local or would met by friendly folks. I had no idea the hospitality I was about to be shown. The driver was a rancher who appeared to be a little younger than my dad. In the seat beside him was his son, a little younger than me. Moments later the rancher's grandson drove up on a four-wheeler. It turns out they were looking for him, saw my orange, and assumed they'd found him. They were as puzzled why I wasn't coming to the truck as much as I was puzzled why they hadn't driven off. We exchanged names and formalities, and then I broached the question of assistance. At the mention of the cougar the conversation became pleasantly lively. We hit it off and I relayed my whole story. We talked about the land, what we knew of it, where I'd hiked in from, the wildlife, and how they made their living here. They were impressed with the distance I was willing to hike and pack meat. The rancher turned to his grandson and said, "See, there are still people who truly hunt out there." We drove down to the animals and loaded them up. It turned out that this was a family I'd been trying to get pedestrian meat-packing permission from for three years through letters and phone calls. After an understandable "no" each year, I was unexpectedly being extracted from the field by truck! The mountain lion was a focal point, and the conversation often returned to it as we bumped along over the two-track ranch roads. They'd seen cats over the years. They've killed cats during the hound seasons. And much bigger ones than the small female I'd encountered. But to catch one unawares and take it unassisted - that just doesn't happen much. We drove back to the ranch house where the son my age lived. The entire family was there and three generations came out to see the cat. 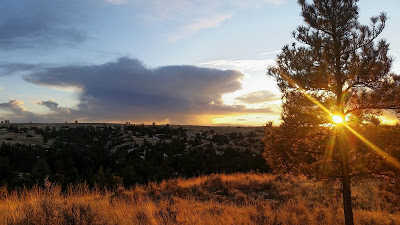 I was then driven to my vehicle by the rancher's son where we stood and talked till the sun was gone. He gave me permission to cross a piece of their land to retrieve my tent and bivvy sack - I'd actually left them set up since I'd planned to hunt that basin more than a day. What would have been a five mile walk over rugged terrain was now a mile-long stroll down a single ridge. I arrived home at midnight that night. Nine and a half hours earlier, at 2:30 that afternoon, right before the pickup had come over the hill, I thought I had at least one more night in the field. Possibly two. I would have minimally hiked the six miles with all its ups and downs in and out twice more. Possibly three times. I'd done it once with a cow elk belonging to my hunting partner six weeks earlier. It would have been nothing new - but that made it both all the more doable and all the more daunting. I knew it could be done, but I knew what had to be overcome to do it. Having been given a ride was no small gesture. This was going to be a day that would be hard to beat. After showering that night I told my wife that I hadn't earned it - I'd packed nothing out and I was about two days and 18 to 30 miles short of deserving that shower. But it felt nice all the same. Greathunt. Great story. Thanks for sharing!